Food trends and cuisines from other regions and countries continue to be popular. 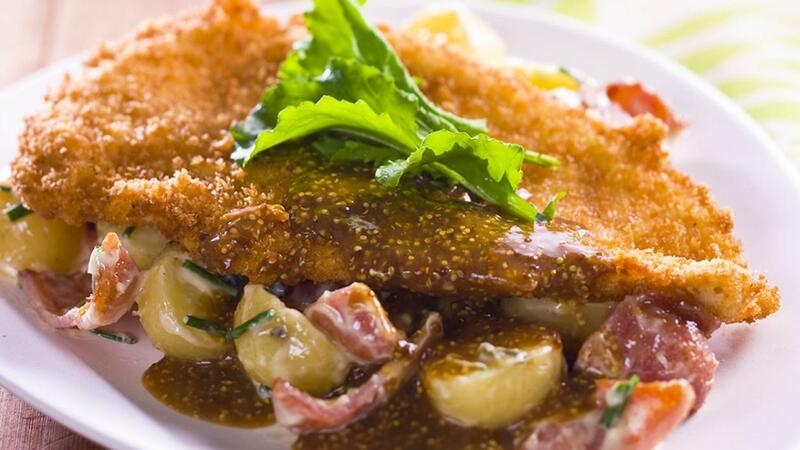 Paring potato salads with schnitzels is on most German beer hall menus and a big seller. Clean and flatten the chicken breasts with a mallet. Crumb the chicken by placing firstly into the flour followed by the egg and lastly the bread crumbs making sure they are well coated, fry until golden brown, remove and drain, keep hot. Steam until cooked in the combi oven, remove and cut in half. Pan fry the bacon until slightly crispy, add to the cooked potatoes with the chopped chives and HELLMANN'S Real Mayonnaise. Mix well. Add the hot water to a large pot and add the KNORR Rich Brown Gravy, bring to the boil continuously stirring, reduce the heat and simmer for a further 2 minutes, add the seeded mustard and keep hot. Place the potato salad onto a large plate and add the cooked chicken, pour over the seeded mustard sauce and garnish with fresh washed rocket.